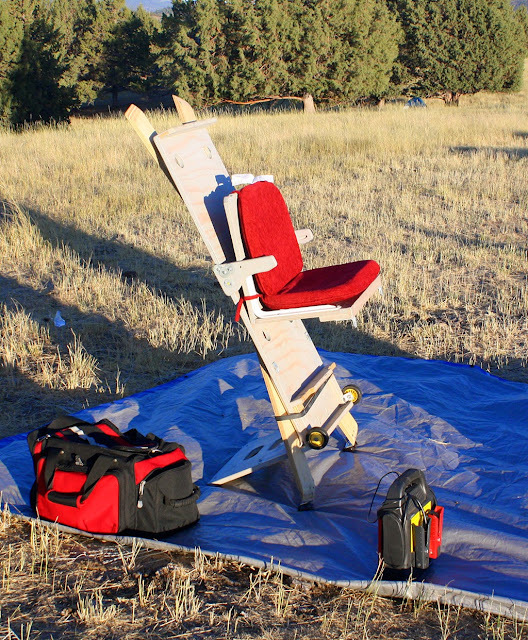 I've been pondering building such a chair, so this gives me some great ideas. Thanks! Looks like you have great skills and some nice ideas. These seem to be more gazelle size. I would like to find is something I could make in more of a water buffalo size. Using a drummers stool for now which is just OK. Thanks for the well done article. In my former life (before retirement) I had a home wood-shop, so I can appreciate what you went through getting to your final product. While I'm no longer able to produce such a chair, I'm glad for this article so those among us who are able may benefit. Great job! Nice Ron, your sawtooth design is particularly elegant. Like you, I find hardwoods lovely materials. I tested a drummers chair at the All Arizona Star Party (fellow Celestron NexStar 11 owner) and thought it was pretty darn nice. However; due to a back injury I need a back rest (we all have our crosses to bear) and the ability to lean back. But if don't need that, drummer chairs are very nice. Working on this article and getting the chairs together again (and building the new one) has got me thinking about converting my first chair to base style like the cherry one and ditching the folding rear leg. I tell ya, it's dang hard to stop fiddling with 'em! Good write up Very useful. Thanks for the how-to’s and for writing up the evolution of your chairs. Great stuff. Definitely some useful designs here. Many thanks to Daniel Barth who designed the chair and was kind enough to share the plans on that site. I used his design with some relatively minor modifications and had a lot of fun making the chair. I'll post photos as soon as it's done. Thanks for sharing this! My husband and I vary in height (I am only 5"1") so adjustable and stable are important. This is something he could do! Many thanks to Daniel Barth who designed the chair and was kind enough to share the plans on that site. I used his design with some relatively minor modifications and had a lot of fund making the chair. Obviously if I was completely happy with that chair I would have just copied it. When I built my first couple chairs I was some what concerned about the very course adjustment feature of that chair. Now I can saw that is just not a problem. I'm still against folding rear legs. Most chairs of this design that I've seen have been in oak (a good choice) but I think folks should have some fun with the design and consider other woods. You're not using that much wood so the price won't get too far out of hand and you'll end up with a chair that is truly unique. Maybe even better looking. The commercial version has an adjustable foot rest and that can be a huge game changer - especially if you need help getting to the seat when it's in a high position. One of the very attractive features of this chair. It works well as is, but I think it could use a wee bit of refinement - or maybe I'm not happy leaving something well enough alone. I look forward to seeing your completed chair! Ron, you obviously came up with some great ideas. Thanks for sharing them! I really appreciate you taking the time to write this up and share it with us! Chair Number 4 uses those (I bought an 8 footer at Lowes for $4.08, or something near that, I was shocked it was that cheap). I choose it because the sawtooth is difficult to do well and to drill half circles like the other chair jupiter122 suggested really needs a drill press. Closure strips just need to be cut to length. But they are short scrap pieces finger jointed together and many of the joints are open - rather sloppy. Good enough for the price and intended purpose but I wanted to avoid them so I picked out a section joint free. Ron is right...the sawtooth type height adjustment does require a drill press (or at least a drill stand) and I didn't know there was such a thing as a closure strip, so I had to go out and buy a drill press (though I did find a small one that worked well enough for $65). Hats off to Ron for coming up with some great ideas. Very nice chairs Ron, nice work. The truly enjoyable write-up, Ron. Thank you very much. I came to the very similar mechanical scheme eventually, even though my chair looks totally different it follows most of the principles you have outlined. First use under the stars last night so we have some good news and some bad. Good news; nice and light, much easier to toss around the alt-az mount as I bopped around the sky with the refractor. Packing it up, using around the campsite and at the scope all in all worked pretty well and I'm very pleased with the much lighter weight. Arizona desert suits this design very well - nice and flat. Bad News: I think I may redo the front foot and either add some material in front or cut it off and lay in a 2x4 flat. When the chair is real low (e.g. when the refractor is looking up high) she is tippy. Just enough to be a bit annoying. I think I messed up and placed seat too far back (first chair with a seat back) so when it comes time to adjust it interferes enough that I have to fight it. Perhaps the closure strip needs some wax to help out. When sitting around during the day I lean back - a lot (back injury so this is specific to me) which bends and stressed the plastic shell which over time will probably lead to failure. Something to noodle over a bit). I'm not sure a solution will be easy to come up with, but a handle to grab the chair while man handling around the scope or the camp site would be nice. Folding chairs are easy but observing chairs by their nature make this difficult. Can you post some pics of it? I'm always looking for good ideas to steal! Oooh! Arm rests! When I do agility photo's an arm rest would be great! Now I need to read your blog. Thank you for sharing this. All good designs for simple observing chairs. This is by far one of the best post I've ever seen here on CN. Thanks once again. Being an amateur wood worker myself, this just gets the creative juices flowing. Thank you for taking the time to write this article. The final chair looks great!